NEW YORK The blue and orange finish line is in place in Central Park, no superstorm debris in sight. Little else is normal with the New York City Marathon. The course will be the same since there was little damage but getting to the finish line could still be an adventure for runners from outlying areas. Such is life in Sandy's aftermath  disrupted trains, planes, buses and ferries, flooded buildings, blocked roads and knocked out power. Mayor Michael Bloomberg saw none of this as insurmountable and defended the decision to hold the race, insisting resources wouldn't be diverted from storm victims. He noted Thursday that electricity was expected to be restored to all of Manhattan by race day, freeing up "up an enormous number of police." "This city is a city where we have to go on," he said. City Council member Domenic Recchia Jr., however, called plans to hold the race "just wrong" in light of the ongoing misery among residents with no food, shelter or electricity. 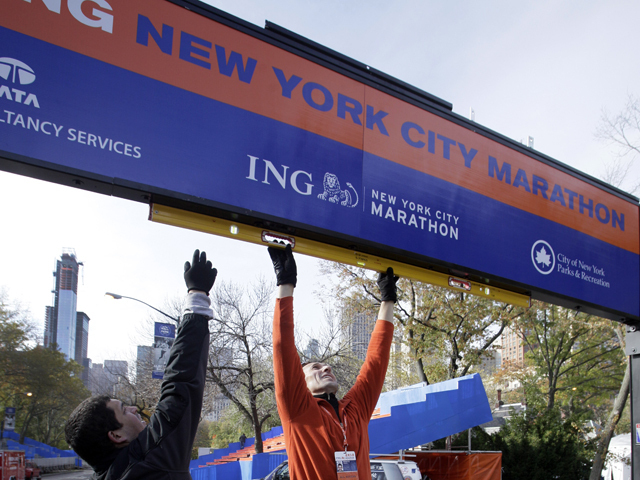 The marathon brings an estimated $340 million into the city. Organizers will also use it as a backdrop to raise money for recovery efforts. New York Road Runners, which operates the event, will donate $1 million to the fund and said more than $1.5 million in pledges already had been secured from sponsors. Some runners will take ferries to the start on Staten Island as in past years. After the storm, organizers initially planned to use only buses, but the city wanted the ferry to be involved. Bloomberg expected full ferry service to resume by Saturday. Runners from Brooklyn, Queens, Long Island and New Jersey, with trouble reaching Manhattan, will be bused directly from those areas to the start. Organizers planned to release complete details on transportation Friday. Many of the nearly 30,000 out-of-town entrants were still scrambling to get to New York, aided somewhat by the reopening of the area's three major airports. NYRR President Mary Wittenberg predicted more than 8,000 of the 47,500 entrants originally expected won't make it. Wittenberg said runners who had to cancel did not seem concerned about losing their entry fee, per race policy, but were simply relieved they would be guaranteed a spot in the popular race next year. Kenyan runners, including men's favorites Wilson Kipsang and Moses Mosop, flew from Nairobi to London to Boston, then drove to New York, arriving late Wednesday. Favorites in the women's race include Olympic gold medalist Tiki Gelana of Ethiopia, bronze medalist Tatyana Arkhipova of Russia and world champion Edna Kiplagat of Kenya. Meantime, many locals prepared for the race while coping with the messes Sandy left behind. Latif Peracha was evacuated from the Lower Manhattan neighborhood of Tribeca. While his building is flooded, his sixth-floor apartment is fine, but he can't move back for at least another week. On Thursday, he walked across the Williamsburg Bridge from where he is staying in Brooklyn to collect his running gear from his apartment. He knew his first marathon was going to be special; now he believes it's so much more. "I think it'll be a great testament to the city's resilience," he said. Dave Reeder was supposed to fly from Denver to LaGuardia on Thursday with his wife and two children. Then they saw the photos of the flooded airport. Should they still try to make the trip? The race felt a bit "frivolous," he said. Hearing Bloomberg on TV convinced him to try and he hoped to volunteer in relief efforts while in New York. His family planned to watch from three points along the course, but subway closures may prevent it. If they can't, it has practical implications for Reeder: He has type 1 diabetes, and his wife carries supplies he might need during the race. Reeder, who is running as part of Team JDRF to raise money for diabetes research, said from the Denver airport Thursday night that his flight was a go. Julie Culley of Clinton, N.J., was stranded in Arlington, Va., when the storm hit. It turned out to be a blessing because she had power and could train. An Olympian in the 5,000 meters, Culley is making her marathon debut. Her parents own a vacation home on Long Beach Island on the Jersey shore, which was rocked hard by Sandy. "I think our family probably escaped the worst of it," said Culley, whose parents were in Clinton when the storm hit. "I've seen terrible pictures of houses uprooted out of their foundations and houses completely knocked out." Her parents told her if Long Beach Island is open Sunday, they'll go there and watch her on TV. "Now that we know for the most part what the damage is and the storm's over," Culley said, "and we can put everything behind us and focus on the recovery effort in the state, I think now it's time to shift focus toward the marathon again." Molly Pritz, the top American woman in last year's race with a 12th-place finish, knew her Tuesday flight out of Detroit would be cancelled. But her solution had a hitch: She's 24 and too young to rent a car. (25 is the minimum age at most agencies.) So her mother drove her Sunday. What should have been an 11-hour ride took nearly 14 because of two accidents in Pennsylvania. But as they came into New York, the weather was clear and the roads empty. "That's because no one else is an idiot driving into the hurricane," Mom said. Runner's World magazine is converting its annual pre-marathon party Friday into a free meal for anybody still displaced by the storm. NYRR canceled Friday's opening ceremony and a 5-kilometer run Saturday to focus all resources on race day. Wittenberg said the city needed to find the right time to take a step forward from the storm's devastation  and Sunday could be that time. "It's hard in these moments to know what's best to do," she said. "The city believes this is best to do right now."